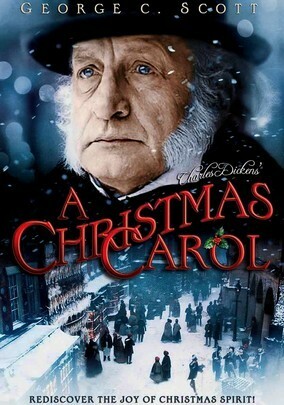 Notes: This production of A Christmas Carol was a made-for-TV movie in the United States, aired on CBS, and netted George C. Scott an Emmy nomination for best lead actor in a miniseries or special. It was good enough to get a theatrical release in Great Britain. Scott himself, interestingly enough, owned the rights to the film, and it went into syndication for many years, gaining a large following. It wasn’t released on VHS until 1995, however, with a DVD release following in 1999. The film is still popular today, and is often seen on AMC at this time of year (although a few years ago, the Hallmark Channel managed to work it in between installments of their 60-day marathon of different original movies in which former sitcom stars or models play the children of Santa Claus attempting to find true love in the modern world). Thoughts: From the first frame of the film, this edition of A Christmas Carol takes a markedly different tone than most. It opens up with Roger Rees’s narrator reciting the first line of the novel: “Marley was dead to begin with…” The scene is a hearse carting old Jacob’s coffin through the streets of London, and you get this terrible, all-pervading chill that makes you feel like you’re about to get the hell scared out of you. Then the mood whiplash hits you, with a cheery fanfare and a burst of music that shows people walking around the city, cheerfully wishing one another Merry Christmas and celebrating with music and packages and a guy playing a trombone which – I know from experience – will freeze right to your lips on a day like that if you’re not careful. It’s a great contrast to Scrooge’s counting house, where Scrooge (George C. Scott) is berating Bob Cratchit (David Warner) for his picky request of a lump of coal to keep himself from freezing to death. Ah, we’re in familiar Dickensian territory now. When Roger Rees – now playing Fred – walks into the office, we’re getting right into the most well-known lines in Dickens’s remarkable catalogue. Scott takes a different tack with Scrooge than many of his predecessors. While many of them being the film as an incurable grump, taking no joy at anything, Scott’s Scrooge is not above a good laugh in the face of his ever-so-foolish nephew. In this opening sequence, the filmmakers start adding to the Dickens story. In an early scene, for example, Scrooge encounters Tiny Tim (Anthony Walters) waiting outside for his father. It serves no real purpose other than to show Scrooge being a jerk even to a little crippled boy. Traditionally, Scrooge (and the audience) doesn’t usually see Tim until Christmas Present pops over to the Cratchit house. This, plus a few other minutes of Scrooge making deals, all go just to show him as an even nastier, more miserly creature than usual. Scrooge is usually a pathetic, greedy man. This is the first version of the story I’ve seen in which he actually seems to exude a little evil in his demeanor. I really like Frank Finlay’s design as the ghost of Jacob Marley. We get the traditional brushed iron moneyboxes blending nicely into the iron chains, all of which match his clothes and skin and cold, dead eyes perfectly. The chains cross in front of him, meeting in an enormous lock that gives the whole thing a look of being intentional, being planned. A lot of Marleys have the chains just draped on them. This is a Marley for whom the chains were specifically forged. Angela Pleasance’s Ghost of Christmas Past has a unique look as well. She carries her “cap” – the light of truth – which often accompanies one of the candle-like versions of the character. She’s not particularly waxen in her appearance, though. With her white-blond hair, loose robes and sprig of greenery clutched in her hands, she has a sort of elfin appearance, like she belongs in a version of a Tolkien story. She gives more attention to Scrooge’s father than most versions do as well. Usually, all we hear of Scrooge Senior is that he’s “kinder than he used to be.” This time, though, Fan (Joanne Whalley) brings him to a father who coldly insists a three-day reunion is sufficient and Scrooge is to be sent straight to Fezziwig’s to begin his apprenticeship. This time around, it’s not Fan’s death that hardens Scrooge’s heart. It’s quite clearly the tender ministrations of his father. It just gets worse as he sees himself leaving his beloved Belle (Lucy Gutteridge), then flashing to a later Christmas in which she is married with children and – worst of all – pitying poor, lonely Scrooge. When he uses Christmas Past’s own “cap” to smother her away, it’s almost a blessing. Edward Woodward’s Christmas Present is about as traditional as it gets – an enormous mountain of a man draped in his green robe and holly wreath around his head. He has an energy that’s practically bubbling out, giggling in Scrooge’s face, but like much of this movie, his laugh is cold. It’s in his scene that I’m really starting to feel what sets this version apart from most others. Usually, the point of A Christmas Carol is that Scrooge has cut himself off from a warm world and he needs to find a way to let it back in. The impression George C. Scott’s version gives is that he lives in a world with very little pity, and he must work to earn back the comfort of the rest of the human race. This segment, again, adds to the story. Bob Cratchit comes home to tell his eldest son Peter (Kieron Hughes) that Scrooge’s nephew, Fred, has offered him a job. Scrooge is convinced Fred is doing it just to spite him, but his veneer is cracking – when Bob says the blessing over their Christmas Eve dinner, Scrooge is unable to resist whispering an “Amen” along with the family, then promptly denies it to Christmas Present. When they hit the famous bit where Christmas Present throws Scrooge’s own words back at him – “decrease the surplus population” and all that – he does so not with the ironic amusement of most performers, but with a bitter anger. Once we get to the reveal of Ignorance and Want beneath his robes, it just seems like more of the same from him. Scrooge, in fact, does his best to remain stoic, even in the Christmas Future segment while he watches Bob Cratchit discussing Tiny Tim’s death. While David Warner breaks down discussing his dead child, displaying depths of compassion not seen since his turn as Sark in TRON, George C. Scott just stands off to the side offering commentary. He’s seen it all, he needs to go. He has a sadness in his voice, but he’s trying to bottle it right up until the spirit shows him his own grave. If this version of A Christmas Carol has a failing, it’s in its nihilism. This is a bitter London full of bitter people. Scrooge comes across not as the outcast he’s made himself, but as another cold man who reluctantly, in the end, decides to try to make his way into the minority of happy people. Sadly, this is probably a bit more realistic a depiction of the time period than most other versions of the story. Even if that’s true, though, it gives this film a powerful strike against it: we never feel like this is a Scrooge that has earned his redemption. Scott’s performance is good, but the world he inhabits feels a bit off, and for that if no other reason, this just isn’t one of my preferred versions of the Dickens classic.